Great choice for a family! This CR-V is a comfortable, dependable, spacious and feature-loaded SUV backed by Honda's reputation for quality and leading resale value. Get quiet cabin and high fuel economy as bonus! As always, this CR-V is very easy to drive and easy to own. 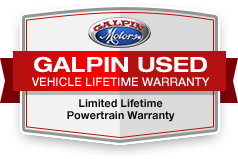 Stop waiting for your dream family ride and call us today so we can help you take this reliable family hauler home and also let us show you 'Galpin Used Car Difference' during your visit. All figures are EPA estimates. Actual mileage will vary. Kelly Blue Book values are calculated based on the current Retail Book. Pricing analysis performed on 4/24/2019. Fuel economy calculations based on original manufacturer data for trim engine configuration.